The favourite Jamsie Hall unships his rider Davy Condon at the seventh at Kilbeggan on Saturday evening when leading. 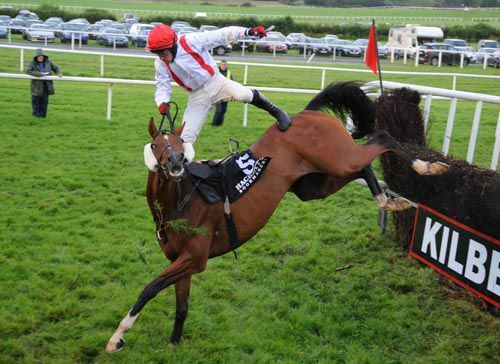 Thankfully both horse and rider escaped unscathed. 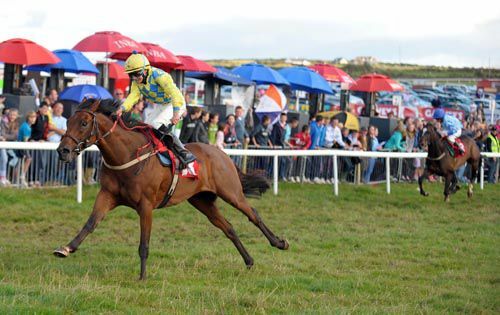 Your Ma & Joe Doyle come home easy winners of the Dingle Derby at the Pony Races there yesterday. 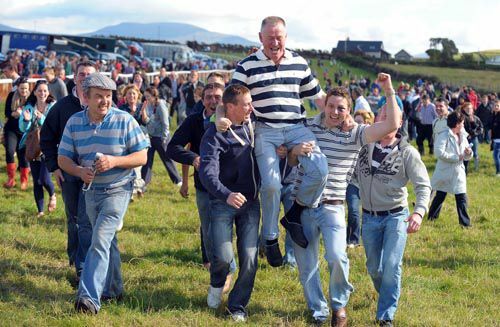 Owner and trainer of Your Ma, Gary Boyle is carried shoulder high by delighted supporters. 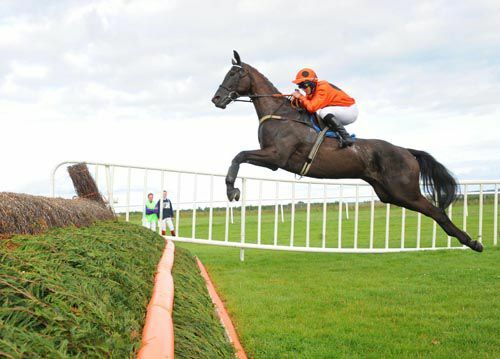 Nodelay flies over the last under Andrew McNamara on his way to victory in the opener at Downpatrick yesterday, the first leg of a double for his trainer Colin McBratney. Deacon Blues came home a very easy winner under Johnny Murtagh in the Group 3, Phoenix Sprint at the Curragh yesterday. 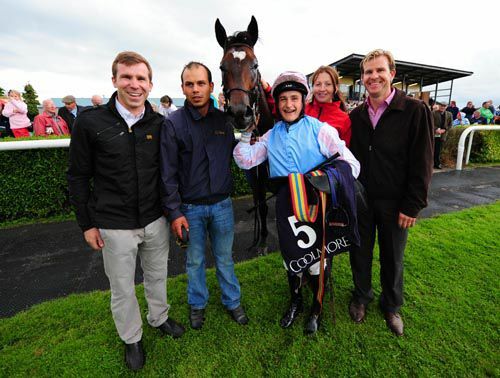 Strait Of Zanzibar with winning rider Shane Foley, trainer Ken Condon (far right) and winning connections after he won the Listed Coolmore Hurricane Run Stakes at Tipperary on Friday. 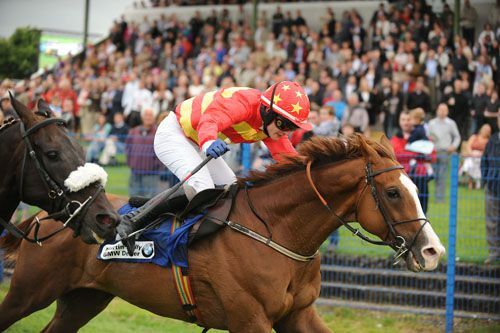 Rattan & Paul Townend get the better of Heavenly Bound in front of a good crowd at Sligo on Thursday evening. The win was the middle leg of a treble for Willie Mullins. 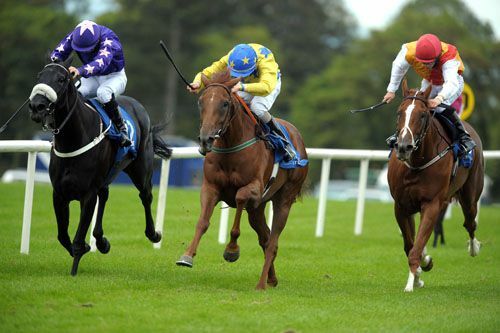 Three in a line at Sligo on Wednesday but it's Regresa A Mi (centre) who comes through to score under Ronan Whelan from Donatis Comet (left) & Melodie D'Amour. Roley put in a brilliant jumping performance under Tim Carroll to score at Roscommon on Tuesday evening, the first leg of a double for his trainer Andy Lynch. 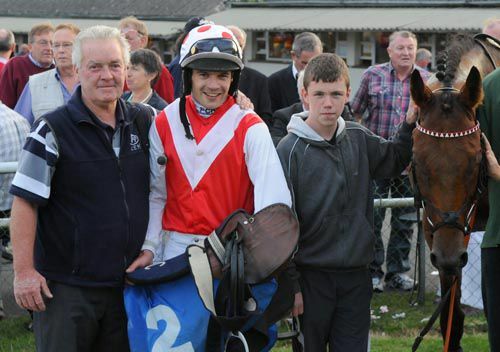 Ahorsecalledmolly completed the double for Andy Lynch (left) in the next race and he is pictured here jockey Robbie Colgan and Andy's grandson Lee Lynch. Runner-up Learn leads the field into the straight as eventual winner Riviera Poet (in second) chases him down at Galway on Monday evening. 19 year old Shane Crimin poses with his first ever winner Aon Sceal with trainer Oliver McKiernan at Wexford on Saturday afternoon. 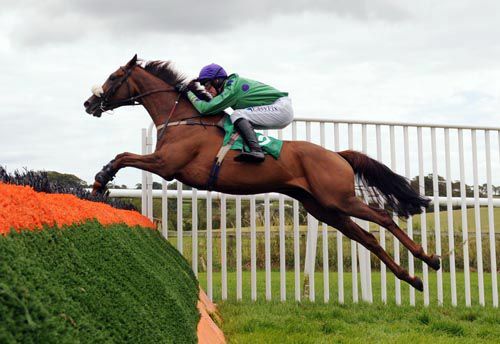 Vital Plot & Brian O'Connell crash out a the last when they looked set for victory, leaving Paradis De Thaix (jumping) to take the spoils. Ucanchoose is a horse on the up after he recorded his second win in the space of four days for trainer Andy Slattery, making all to score at Tipperary on Saturday. Johnny Cullen has an anxious moment at the last as Scene of the Crash reaches for it, but still comes home a comfortable winner of the opener at Limerick yesterday for Myles Sunderland. Jockey Cian Collins gets some sugar onboard before the start of the Pony Races at Abbeyfeale, yesterday. The Grey Dancer sets a trend with his pink bridle after he won at the Castleisland Pony Races yesterday. His delighted rider Denis Linehan & Emma Jones are also pictured. Tarcisio (winner) veers into Alkazim (runner-up) approaching the line at Limerick on Saturday evening but after a stewards enquiry the result stood.